Happy Sunday Sweet 'n Sassy Friends! 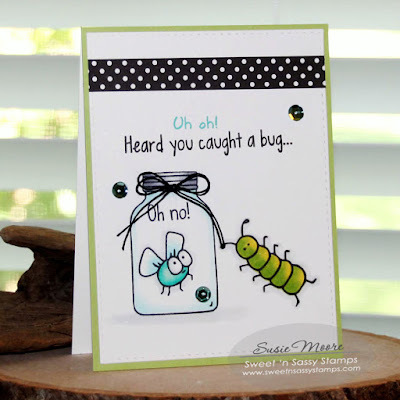 It's Susie here to share a card using the Summer Fun Winnie clear stamp set. Winnie is always dressed perfectly for every occasion. She is also always ready to celebrate!! I LOVE that about her! Today she is celebrating a birthday with a pale pink banner. 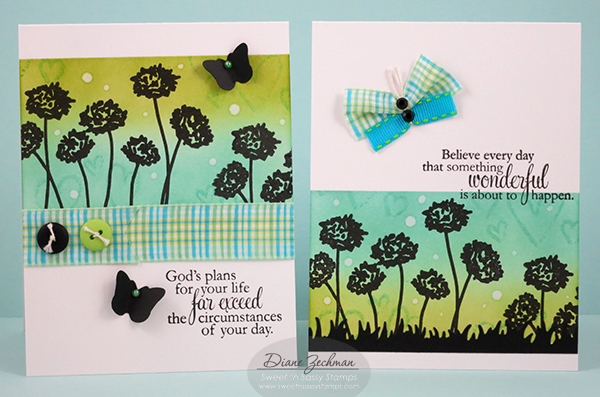 Today I am sharing two cards using the Celebrate Today and Grunge Elements 2 stamp sets. Both cards were masked with post-it notes and then I sponged the green and blue. The flowers were then stamped with Versafine Black ink. 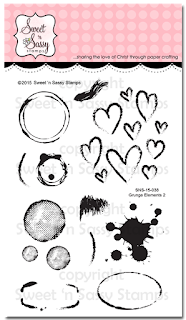 Some hearts from Grunge Elements 2 were stamped lightly in blue. Then the masks were removed. I added a few tiny drops of water which turned quite white! On the first card I added a band of ribbon and a few buttons, and some diecut butterflies from the Monarch dies. I had a tiny scrap of ribbon left from the strip I cut, so I turned it into a ribbon butterfly for the second card. A strip of grass was also added from the Fence & Grass dies. Hi its Kari here :) I'm still excited from my 1st host experience that I'm feeling totally charged up for this one. With this card I used the Butterfly Flourish stamp set made by Sweet and Sassy Stamps which you can find at the Sweet n' Sassy Stamps Shop. This set is so beautiful...you need it in your collection. I applied the shear ribbon with white embellishment piece. The boarder is made with Martha Stewarts stitch punches. I used Soft suede card stock for the stitched piece and the card the base. Thanks for stopping by and make sure you pick up these stamp sets when you stop by the Sweet n' Sassy stamp shop :)) Have a great day! Hello! It's Monika here today, with a CUTE card. 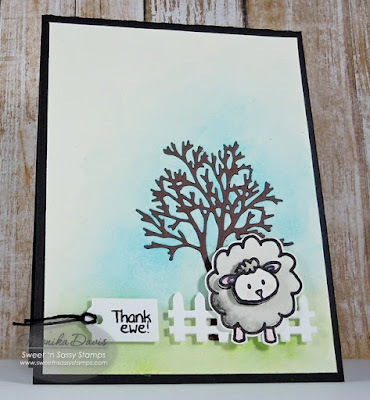 I am a flower and butterfly girl, so it's not easy to make a CUTE card with CUTE images... but I decided to ink up the super CUTE sheep image from CUTE Critters clear stamp set. 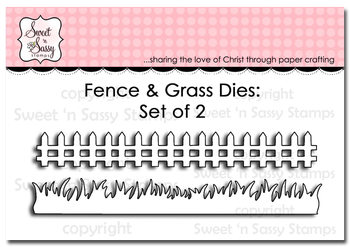 I used Bare Tree, Mini Tags and Fence & Grass (currently unavailable) Die sets to build the background. To jazz up my somewhat simple card, I used a technique: Inlaid Die-cutting. 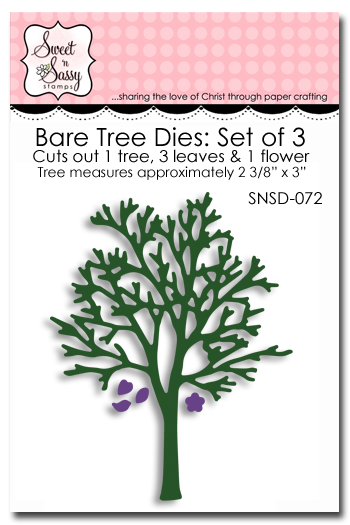 I cut the tree out of the background, then cut another tree out of brown card stock, and laid the die-cut image into the die-cut opening. Now it sounds pretty easy, and it would be... but with the intricate branches, I had to make sure not to lose all the 'scrap' pieces falling out of the tree. While it took a little bit of careful cutting, the end result looks pretty good. Hi friends! Kim here today to share a fun card I created a few weeks ago, using the Get Well Critters stamp set. Seriously, is this not the cutest little set ever! Caught a bug...bug in the jar...I can't even stand it. This, my friends, is my sort of humor. LOL! 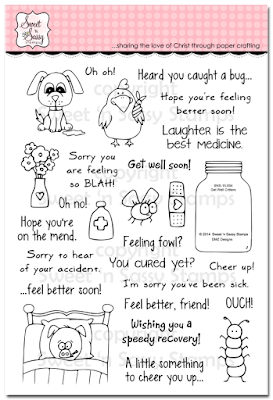 The stamp set includes nine images and 18 sentiments, and it's perfect for creating little scenes...or shaker cards! I hope you enjoyed today's project! I'm a little obsessed with shaker cards lately...how about you? 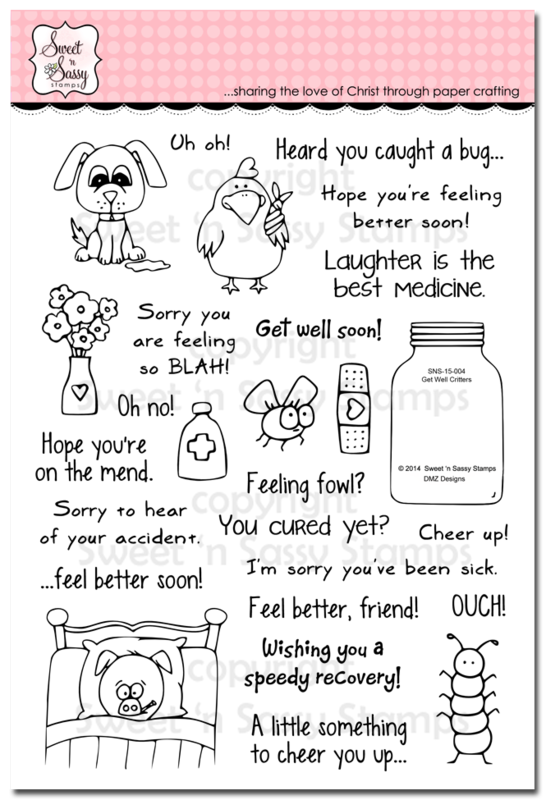 more get well cards in my stamping future! Hello Sweet Friends! Julie here and I am still having fun with “Christmas in July” ! If you have not had a chance to join us yet, we are celebrating with our "Christmas in July" Creative Team blog hop- please see this post for more details. 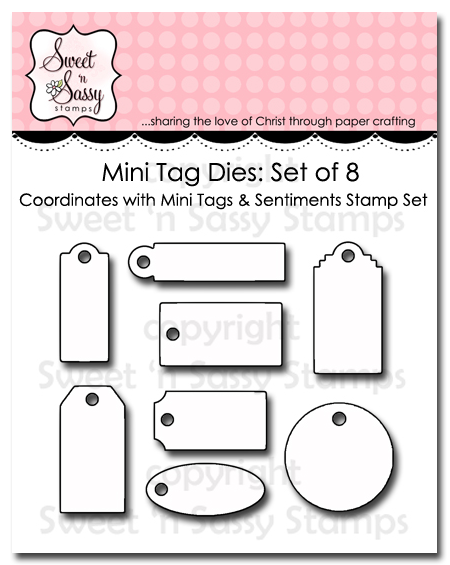 Also, we are having a sale on all Sweet ‘n Sassy Christmas stamps sets! Save 15% through Sunday July 23, 2016- please use code CMASJULY during checkout. 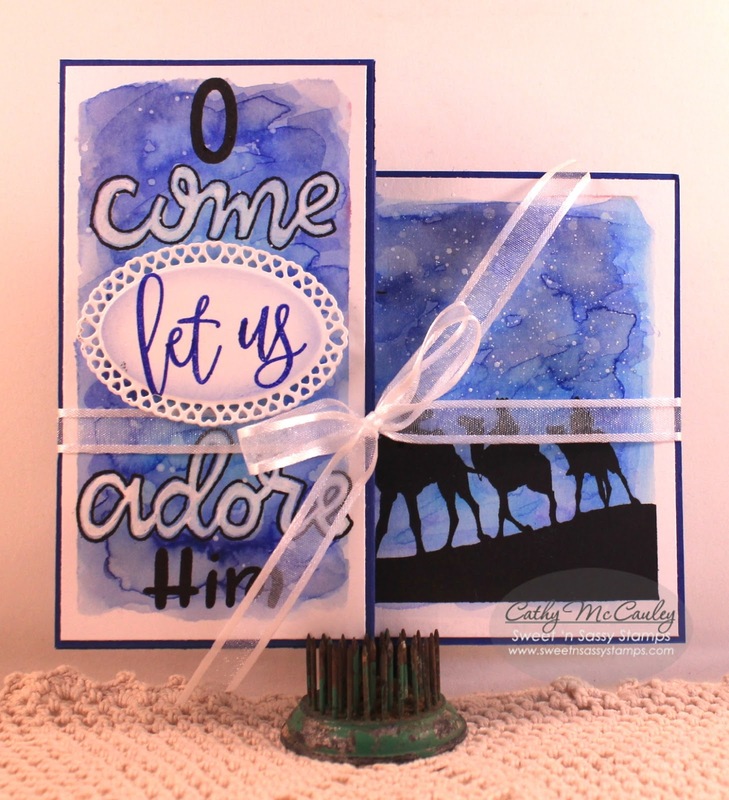 For the “Christmas in July” blog hop I featured a very vintage style card using Old-Fashioned Christmas along with three other stamp sets and for this card, I decided to use just the Old-Fashioned Christmas clear stamp set to create a one layer mixed media card. I love the versatility of the wonderful image and sentiments in Old-Fashioned Christmas and by omitting the horse and carriage for this card, achieved a completely different look-don’t you agree? 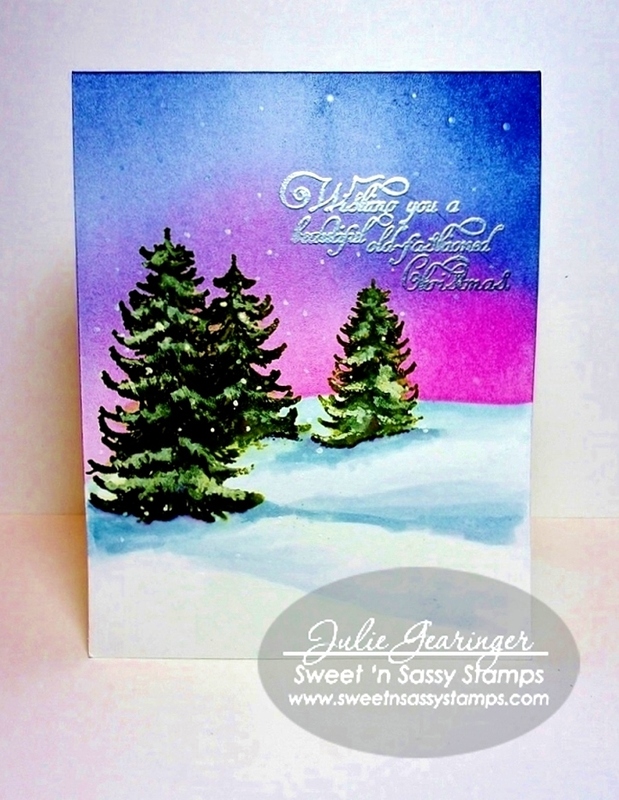 To create this card, I scored and folded a piece of 4 ¼” x 11” white cardstock in half, created a mask for the snow bank and sponged distress inks (Picked Raspberry and Chipped Sapphire) for the sky area. I lifted the masks and re-positioned to sponge a bit of Chipped Sapphire to the snow banks. I decided to just highlight the trees from the Old-Fashioned Christmas clear stamp set, so I inked the trees first with Peeled Paint distress ink, stamped onto the panel, then re-inked using Forest Moss distress ink and re-stamped over the first image. I used a water brush to blend some of the ink, added shadows with Stormy Sky distress ink along with a black water-based marker. A few snowflakes were first added with a white marker, then I used white acrylic paint with a small paint brush to add snow to the pine tree branches as well as a few more snowflakes. I heat embossed the sentiment with pewter embossing powder to finish off the card (this made it a bit difficult to photograph). Hugs and I hope you have a very blessed week! Christmas in July Blog Hop & Sale! We are also excited to pass along a fun weekend sale on our Christmas stamps! Enter code CMASJULY during checkout TODAY through Sunday, July 24th and receive 15% off our entire line of Christmas stamp sets! Now onto this fun and fabulous hop. You will be able to find all of the team participant blogs at the end of this post. Simply click on their name and you will be taken to their blog. The list will be on each person's blog, so no need to hit the back button. Just look for the next blog in the line-up and off you go! Please be sure to leave the girls some love along the way. We will be drawing a winner from all of the blog comments and that person will receive a FREE Christmas stamp set (in stock) of their choosing from our line! Before I send you on your way, here is my contribution to the Christmas in July Hop. It features our adorable and popular Born This Day stamp set AND coordinating dies, which I am happy to report are in stock NOW! The Born This Day image was colored with Copic markers and die cut with the matching die. I used some DP to put behind the "window" to create the look of the night sky. I added the star die cut and a rhinestone, plus some Stickles for the additional sparkle. 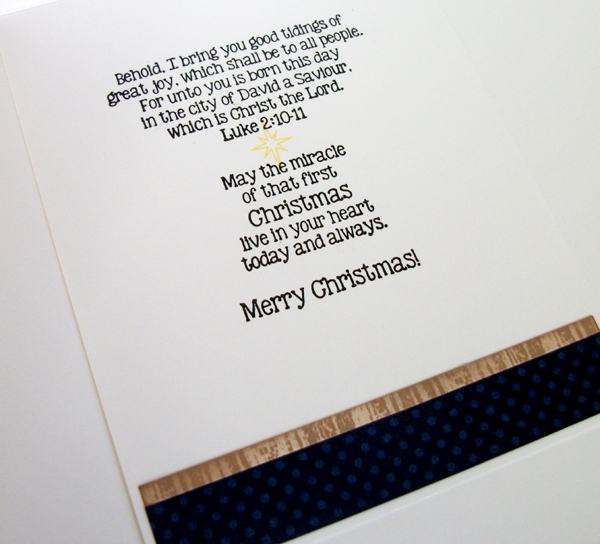 The sentiment is from our Jesus is the Reason digital set but it is also available in our Jesus is Born clear stamp set. Yay!! 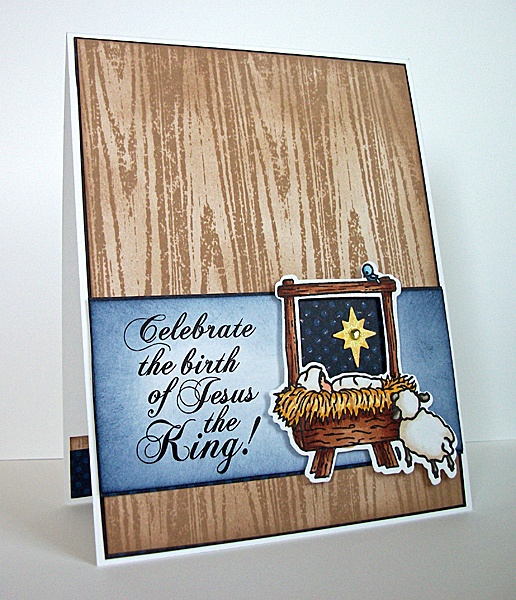 The inside features a few other stamps from the Born This Day set including Luke 2:10-11. I love adding scripture to my cards and this set has plenty of great options. 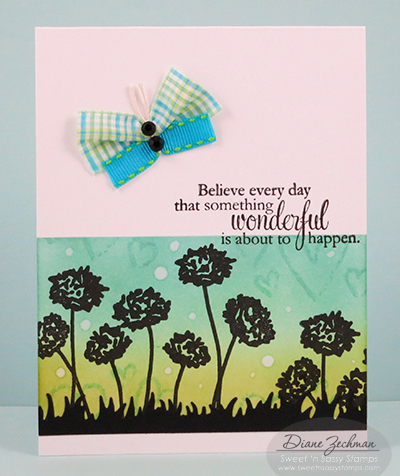 If you'd like to see some more fabulous cards our team has created with this set, CLICK HERE. 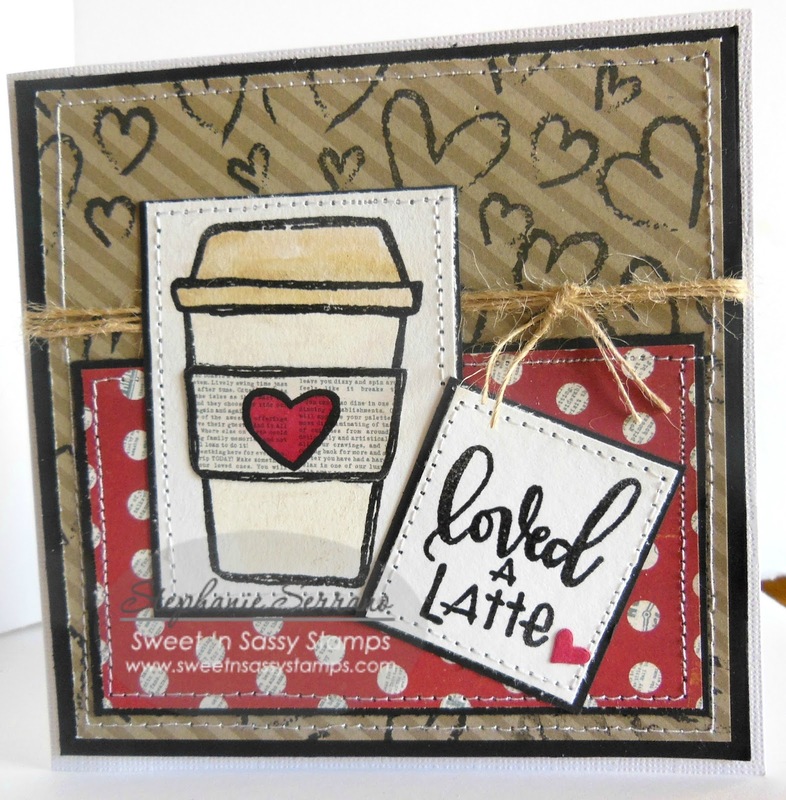 Hello friends, Stephanie here with a card using 2 sets today. 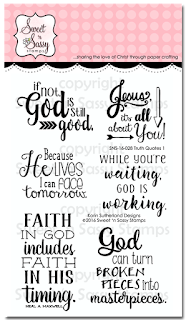 The first set is one of the Creative Worship sets called Fill Me Up, I LOVE this set and it is great for making cards as well as journaling. The second set is called Grunge Elements 2 and this set is perfect for making your own backgrounds which is what I did with it today. The designer paper I used is from Simple Stories. Hello Sweet 'n Sassy friends, it's Ceal here to share with you today. I am using two different sets for my card, The Sea, one of my all time favorites and Truth Quotes 1 recently released. God's timing is something I think we all struggle with, we are an instant gratification society and therefore it is hard to wait upon the Lord for things in our lives. We may think that God is silent or distant as we are waiting, God knows us and wants the best for us after all He created us. 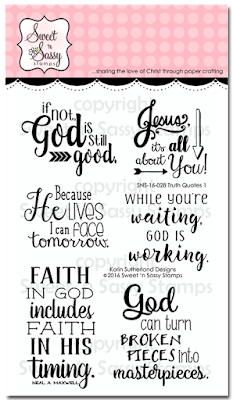 His thoughts and ways are not our thoughts and ways, neither is his timing our timing, but we must have faith not only in Him but in His timing as well. The struggle is real but God is patient. I love this image because it reminds me of the story where Jesus was in the boat with the disciples, who like us had very little faith. The storm was raging and He calmed the wind and waves. In my mind this is what I see after he calms the sea. 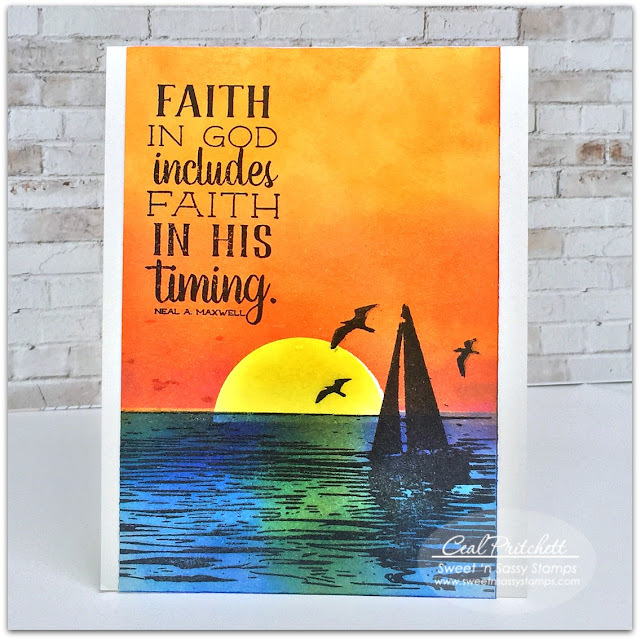 To achieve my background I masked off the sun and blended distress inks. Hello everyone! For the card for today I finally got out my watercolors again. I love to play with watercolor paints but I don't use them enough ;). I love the beautiful flowing colorful effects you can get with them. 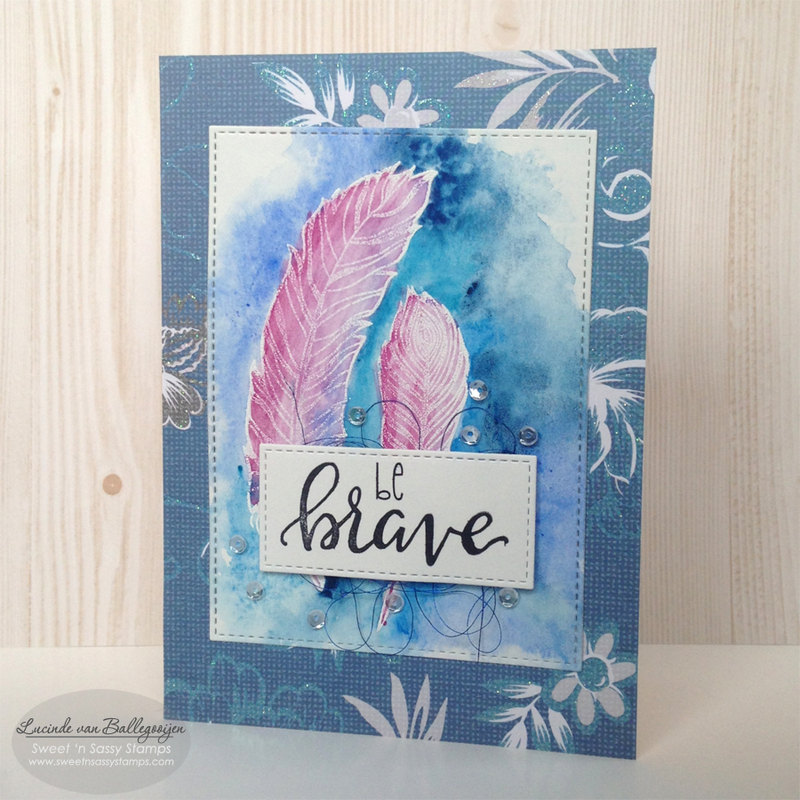 For this card I stamped two feathers from His Wings on watercolor paper and I used embossing powder to prepare them for my watercolors. 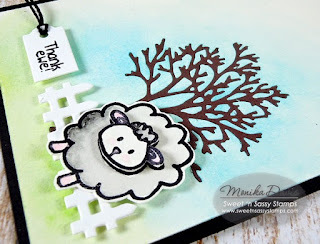 The embossing powder makes a great base for watercoloring while the lines stay a bit raised so you can create 'puddles' of color on your card (and it's easier to stay in the lines haha). After my watercolors dried I diecut my watercolored panel and adhered it on a patterned paper. I diecut a smaller frame for my message and added that to my card with foam tape. I added a little piece of blue twine behind the frame and added a couple of sequins to finish my card! Hello Sweet 'n Sassy friends! Korin, Rebecca, and Krista have done it again! 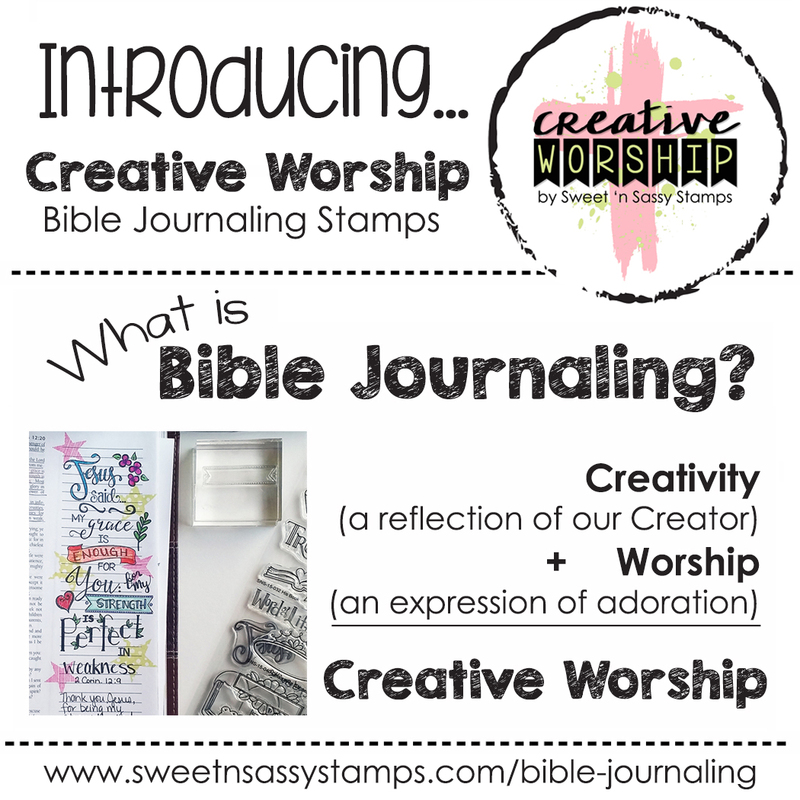 They have created two more awesome stamp sets for the Creative Worship line that are being released today, and the best thing about them is that they are ideal for Bible journaling AND card making, AND they are now available at the Sweet 'n Sassy Stamps Store! 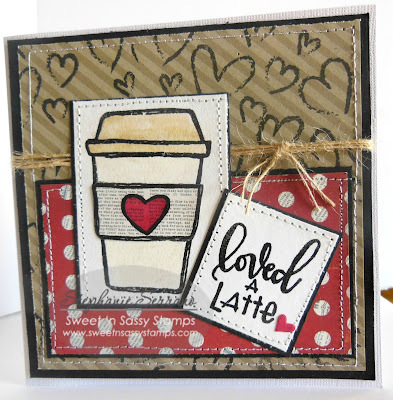 We can't get enough of Rebecca's awesome lettering and her new All Your Heart stamp set is a perfect example. I was able to use All Your Heart to create my first Christmas card for this year! Distress inks were used to make a water color wash on a piece of Mixed Media paper and the words from All Your Heart were stamped in Jet Black Archival ink. Since distress inks react to water, the insides of the letters were painted with plain water to remove the ink. The white area inside the letters were then enhanced with a white Sharpie paint pen. The inside panels of the Z-Fold were created the same way. 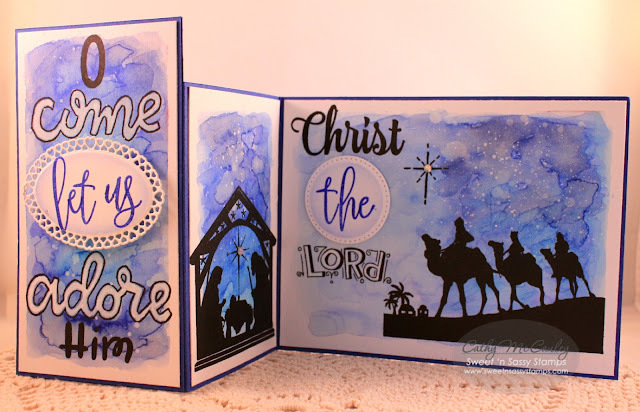 Other stamp sets used to create this card include Classy Script Alpha, All of Me Alpha, Season of Love, We Three Kings, His Name, and Worship the Lord. 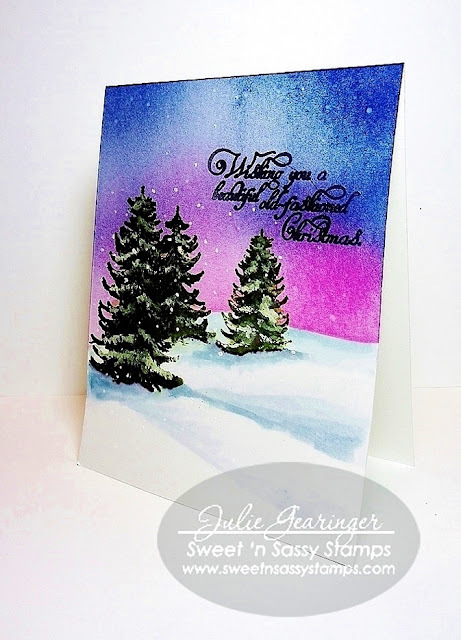 A few splatters of white acrylic paint and rhinestones were added to finish the card. 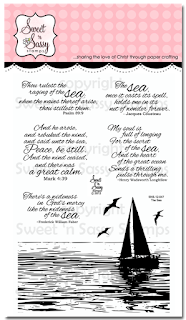 If you liked the Good Shepherd stamp set designed by Krista Hamerick, you will love the second addition to her Jesus line, My Creator. 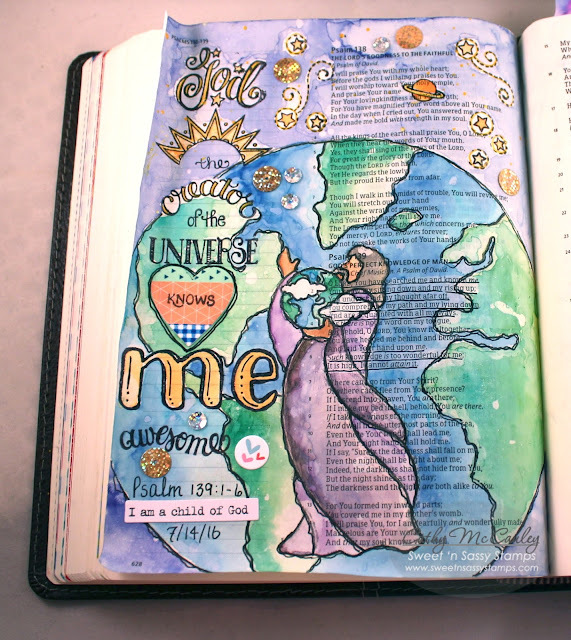 This set was used to Journal Psalm 139:1-6 in my Bible Journal. The page was prepped twice with Dina Wakely clear gesso. You may have noticed that the Jesus from My Creator is facing the other way in my Bible. Jesus was stamped on a piece of acetate, placed ink side down on the Bible page, and rubbed…this reversed the image. The globe was hand drawn around Jesus and the words stamped. The Outline Alpha Stamp Set was used for the word "me." The page was then colored with Peerless water colors…love using water colors because you can still read the words! 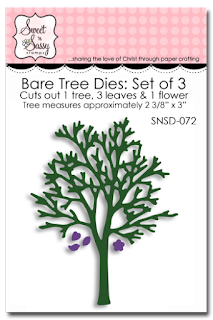 A small scrap of card stock was covered with Washi Tape and cut with one of the Heart Dies (currently unavailable). Everything was traced with a Pitt artist pen. Splatters of Glimmer Glaze, some glittery sequins, and a few stickers were added to finish the page. As I was working on this page I kept thinking about how awesome it is that our all-knowing and powerful God, the creator of heaven and earth, knows me intimately…and not only me…He knows you, too! This truly is too wonderful for me to comprehend! 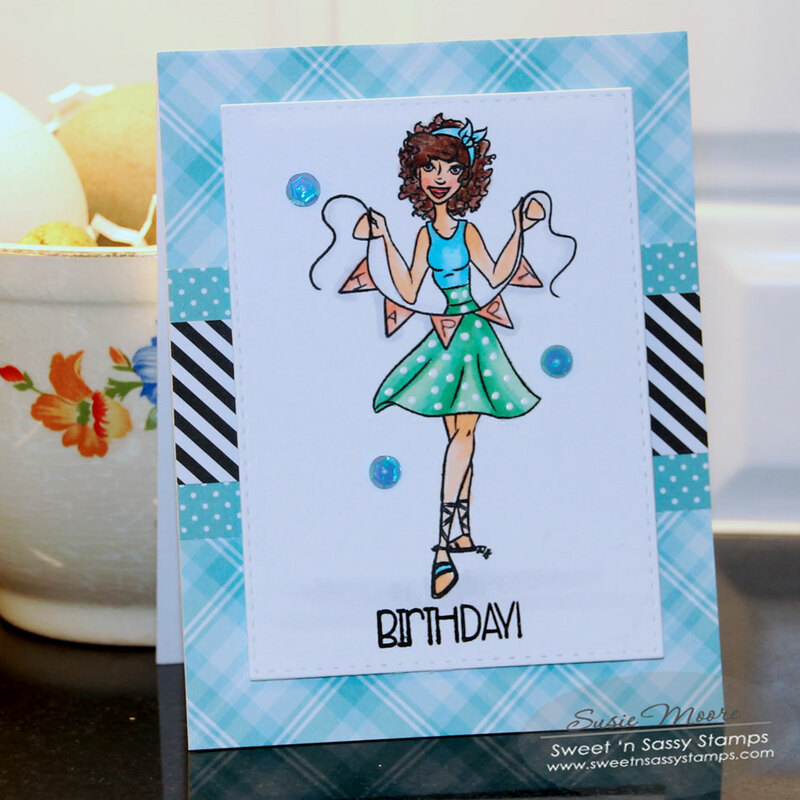 Be sure to check out our Facebook Page to see how the other girls on the Creative Design Team used My Creator to make gorgeous cards! 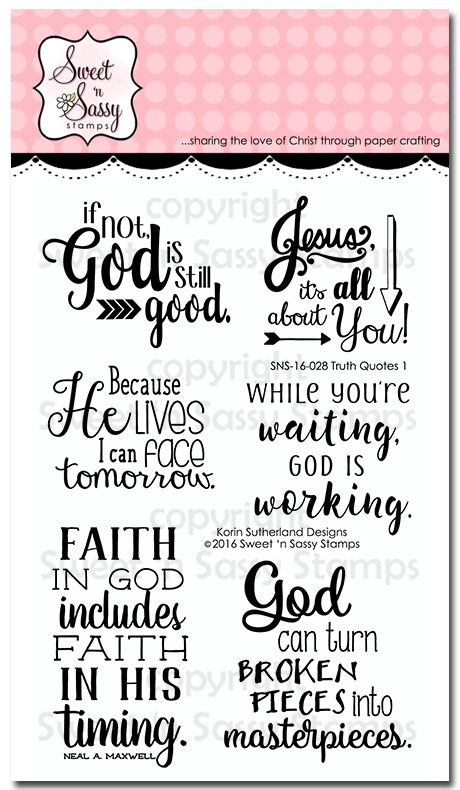 Whether you are a card maker or a Bible Journaler, both of these stamp sets would be perfect for your collection. 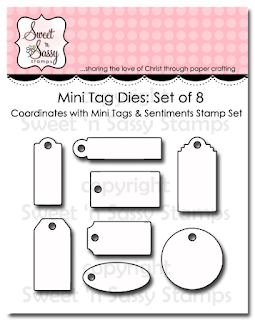 Hurry on over to the Sweet 'n Sassy Stamps Store to pick up these wonderful new sets before they sell out! Thanks so much for stopping by today! Blessings and happy stamping! I am soooo excited being that this is my first exhibit here at SNSS. I can't wait to share what I have created with you. To make this card I first cut my paper to my desired size. 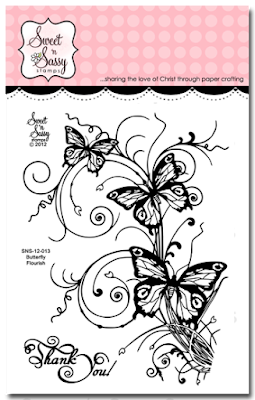 Then I used the MISTI to stamp my butterfly image where I wanted it. With this card I used a blue spectrum ink pad along with the Tempting Turquois and Gable Green markers. 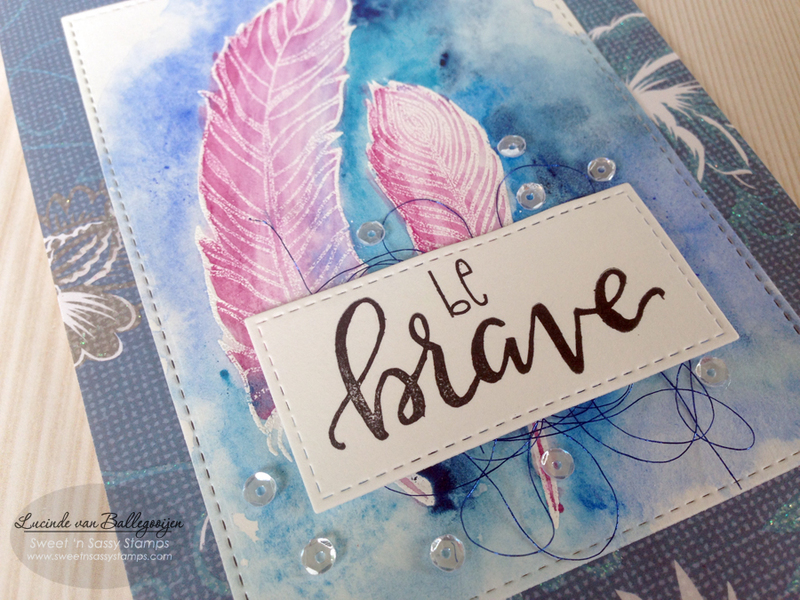 I then applied clear embossing powder for a nice finished look. I let the ink dry for about 3 minutes just to ensure it wouldn't smear when I put it in a dry embossing folder. I used a Mum flower folder by the Paper Studio and chalked the flowers lightly with Summer Sun, More Mustard and Rose Red. I applied the Tempting Turquoise ribbon to the card. I layered the base with white then Gable Green card stock. Next I placed it on the white card stock base. I stamped another set of butterflies which I cut out by hand to give the card some dimension. Next I added some glitter to the butterflies just for good measure ;) After the glitter was dry I applied the pearls to the body of the butterflies. 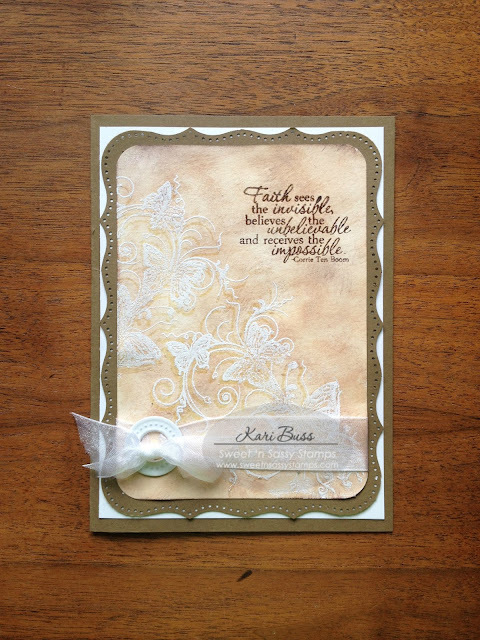 I used a Tim Holtz die cut for the "Thank You" sentiment which is also in the Butterfly Flourish stamp set by Sweet and Sassy Stamps. I applied two larger pearls just to have some continuity across the card. Thanks for stopping by :) Have a blessed day! Happy Wednesday Sweet 'n Sassy Friends! 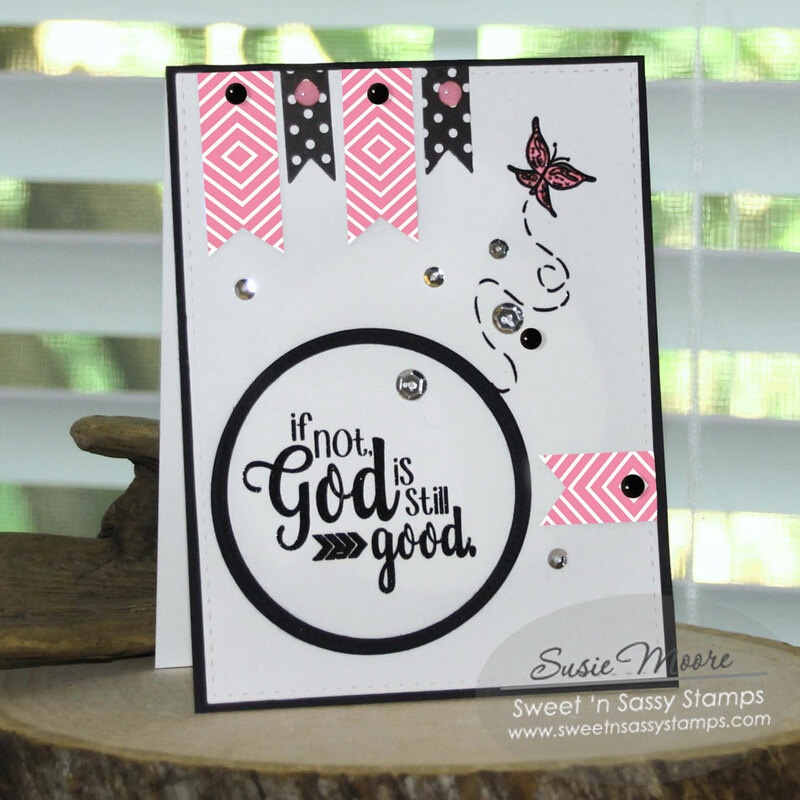 It's Susie here to share a card using the brand new Truth Quotes 1 clear stamp set. I also added the cute butterfly from Winnie's Garden stamp set which is packed with some of the sweetest springtime images! My sentiment is stamped and embossed in black as is the butterfly. I stacked the black circle frame three deep to add some dimension to the card. I added some banners, sequins and enamel dots to complete my card. Both sets are available in the Sweet 'n Sassy store. Click right here to see what's new. 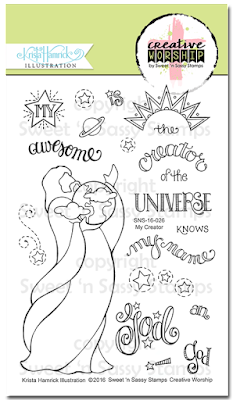 We can't wait to see what you will create with our stamps! 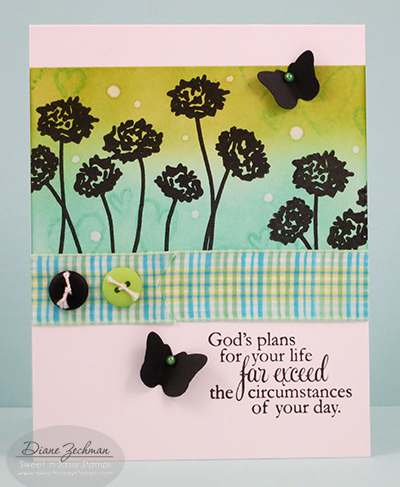 Today I am sharing a card using the new Truth Quotes 1 stamp set, along with flowers from Bloom & Grow and butterflies from New Beginnings. The flowers were stamped all over the background and then the same ink was used with a stencil on 2 corners. The butterflies are shimmery with some Wink of Stella added to the wings.